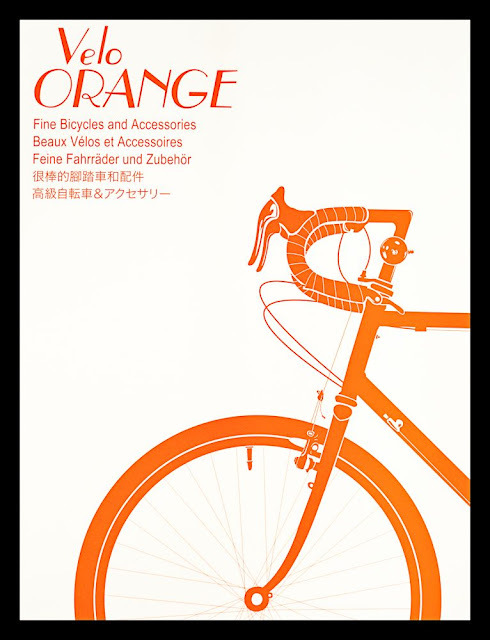 The first two VO posters, "Enjoy Life" and "Orange Bike", are now available. Both poster were created by graphic artist Dylan Hale. They are printed on 80-pound Cougar Natural paper using the spot color process. (Note, the black border is the background, not part of the poster) The size is 18 x 24-inches. Posters are shipped rolled in a mailing tube. The posters are $12.50. But, this week, if you add a poster to an order totaling over $150, the poster will be free. The free poster deal ends midnight on Sunday, March 6. VO dealers and shops can get a free set of posters with wholesale orders, just ask. BTW, would either of these images look good on a t-shirt? It's time for another coupon code sale. 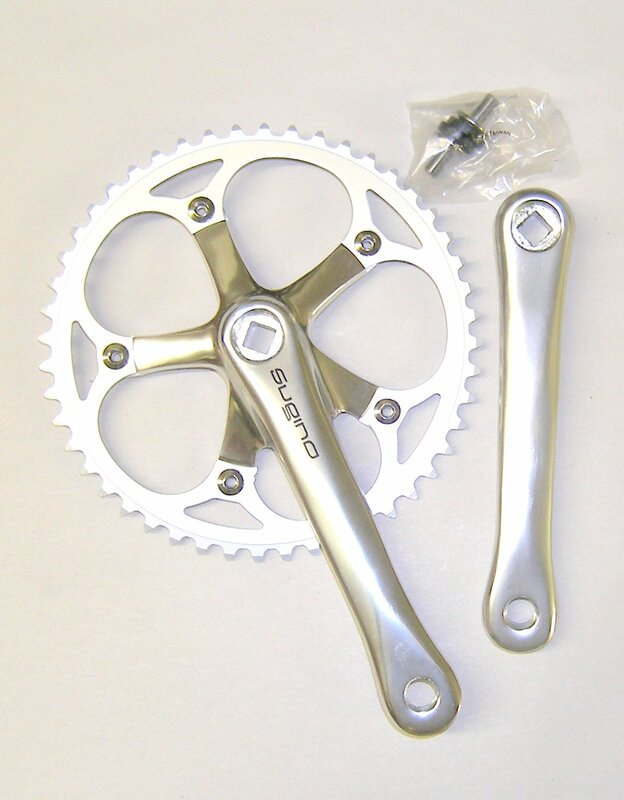 We still have a lot more Sugino cranks than we should. 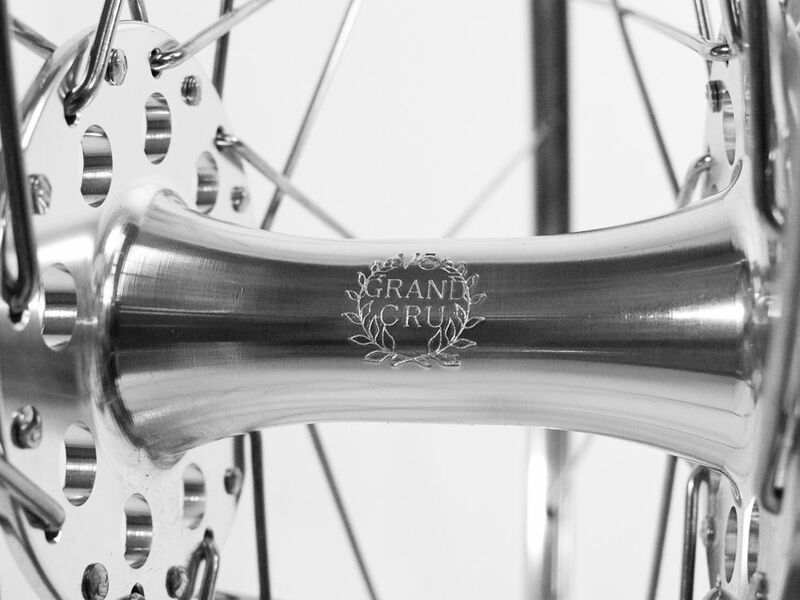 We simply didn't anticipate how many of you would choose the new VO and Grand Cru cranks instead. So we're offering 30% off on any Sugino cranks in stock. We need the warehouse space for the hundreds of VO cranks due in soon. The coupon code is "cranky". Click on "My Cart" (not "Checkout") on the top right of the screen to enter a coupon or a gift certificate. The sale runs from midnight tonight (2-25-11) to midnight Sunday (2-27-11) Eastern US time. Also, check out the items on our specials page. I've been riding bikes with 2x10 or 2x9 drive trains for many years. They are set up with a 46t/30t crank and a cassette with small cog with 11t or 12t and a large with 27t or 28t. I find that I can ride in the 46t ring more than 90% of the time. Only on steeper hills do I need the 30t, which I regard sort of like a Jeep's "low-range". 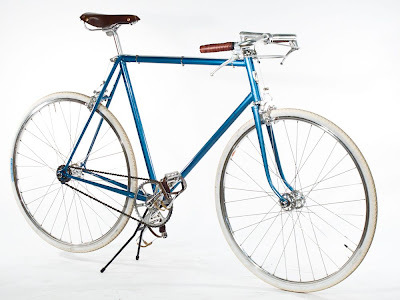 Of course this won't work for every terrain, but in the flats and rolling hills around here it's perfect. It's even fine for occasional trips to mountainous Western Maryland or West Virginia. For shifting I've set up most of my road bikes with 9 or 10-speed Campy brifters. I know there is still some resistance to index-shifting among the retro crowd, but I've been using it since the 1990's without issue. I've also had no issues with 10-speed drive trains. So what's the experiment? Well, I've noticed that 1x10 drive trains are starting to appear on more and more mountain bikes. Shimano is making wide range 10-speed cassettes, 11t-36t. 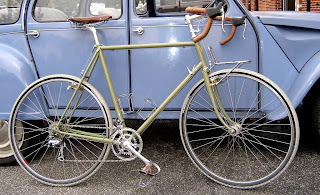 I wonder how a 1x10 drive train would work on a rando or touring bike? I think I'll build something along those lines later this year. Anyone have any experience with 1x10 on the road, or any thoughts? How are the various parts of a bicycle component assembled at the factory, say the parts of a brake, or headset, or a seat post head? In my experience they are often assembled at a large table by a group of jolly women. I'm not kidding, more often than not there is a huge table with bins of parts in the middle and a half dozen women, often middle aged, screwing together all those little pieces. And they are almost always chatting and laughing and having a great time, maybe cracking jokes about the funny visitors. Usually these assemblers do a great job, but not always. Which brings us to the point. We've noticed that on a few of our seat post in the last shipment the clamp on the top is assembled front-to-back. The clamp is almost symmetrical so it's a very easy mistake to make. 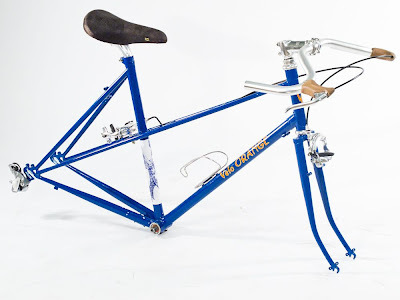 Having it backwards limits the seatpost's range of tilt and it might not clamp as tightly as it should. 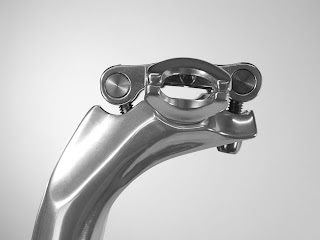 So have a look at your seatpost and if the clamp doesn't line-up, as in the photo, switch it front-to-back. It only takes a couple of minutes to do. We've been pursuing a project to make really high quality crochet-back cycling gloves for a couple of years now. After examining at least a dozen prototypes we're giving up for a while. We simply have not been able to get the quality we want at anything close to a reasonable price. We may eventually find some little factory in a less obvious place that can do what we want, but for now we'll give the project a rest. 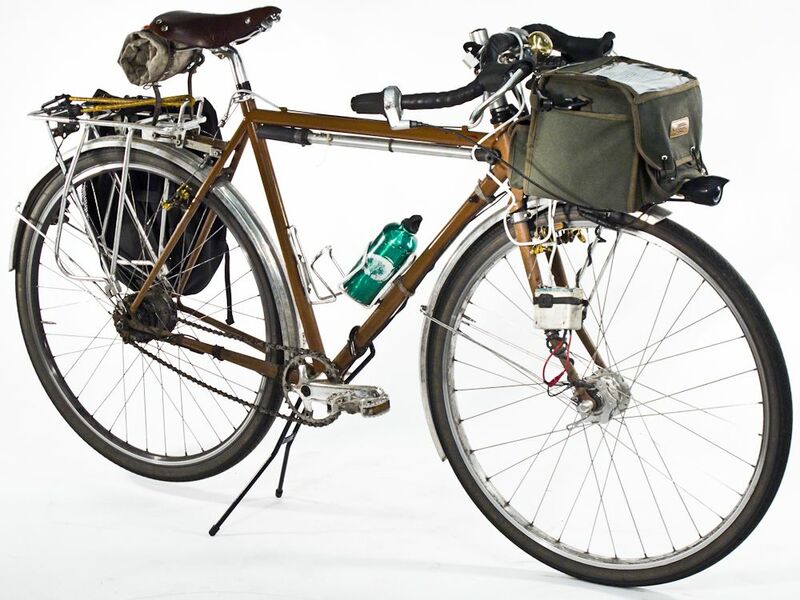 We have also delayed our pannier project, too many quality issues with hardware. The sewing and materials are not as nice as we'd like and we need to re-think the attachment hardware. I'd like to really bump up the quality of these and may need to visit sewing shops in Vietnam or Central America to find one that can do what we want in the smaller volumes we need. I'd love to have them made in the USA, but from what I've seen it would double the cost. If any US shops are interested I'd be happy to talk. I have been using more and more of your parts for my custom builds, and would like to say thanks for putting out great products at a nice price. As you know these parts have been unobtainable and just plain expensive for the past 30 years. I now can offer a custom lugged "constructuer" bike complete for under $3500 and that includes your Grand Cru parts. This is unheard of in the custom market.... Keep those Grand Cru parts coming! I don't want to start another long paleo diet/health discussion, but for those interested, here are a few of the blogs I follow: DrBriffa (smart MD) PaNu, Marks Daily Apple, Hunter-Gatherer, The Heart Scan Blog (highly recommended), Health Correlator, and the best of the bunch is Whole Health Source. I actually follow many more. Using Google Reader makes it very simple; there are typically get only 5-10 new posts each morning. It's really nice in Maryland. For the first time this year temperatures are above normal; we're getting sunshine and highs in the 50s and 60s. But we have to go to Minnesota for a weekend of snow and rain! Tom, Robert, and I are representing VO at FrostBike. Please drop by our booth if you're attending. And bring us something warm to drink. More of our Grand Cru products will be getting stamped logos instead of laser-etched. We think it looks nicer. 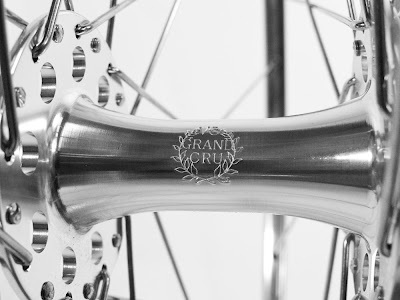 The photo is of the first production Grand Cru fixed hub. They should be in a container arriving in March. I wasn't certain at first, since I've grown so used to my Cross-Check over its 25k or so miles, but the Rando proved itself to be a different bike immediately. It's lighter and more comfortable. 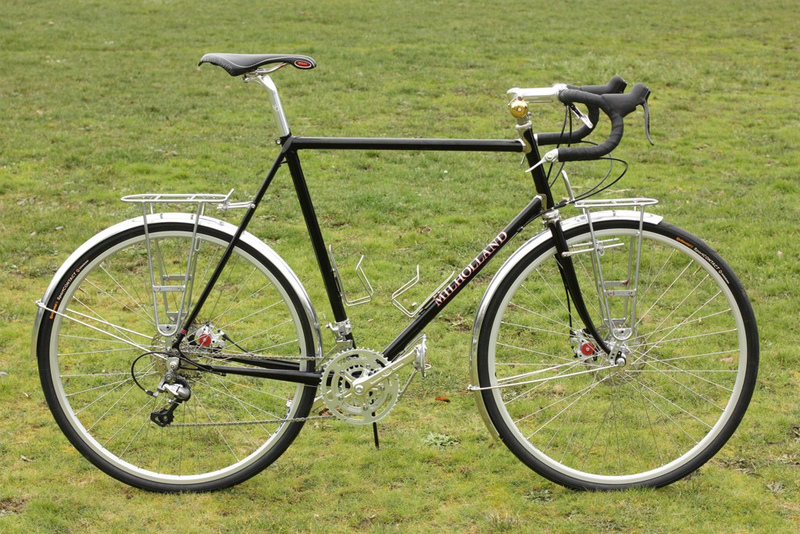 Part of that feeling is the long chainstays and traditional-diameter tubing, I think. It seems to soak up bumps and float over sketchy patches instead of transmitting the shocks straight to my body and wearing me out. The Rando has lower-volume tires but still feels very cushy. I've only done two centuries on it so far, but I haven't felt beaten up after any of them. The allure of the Rando is that it just goes, without complaining. It climbs well and responds when you hammer. Strangest, though is that it feels sluggish on the descents. I thought at first that I was descending slowly, but I nearly broke 40mph. What feels like sluggishness isn't at all - it's stability. The Rando doesn't bounce and twitch at high speeds and doesn't lock into a line; it feels slower, but you can safely go faster. It's a very nice feeling to not be locked into a line; the Rando doesn't wander or twitch, but it doesn't feel like its on rails either. 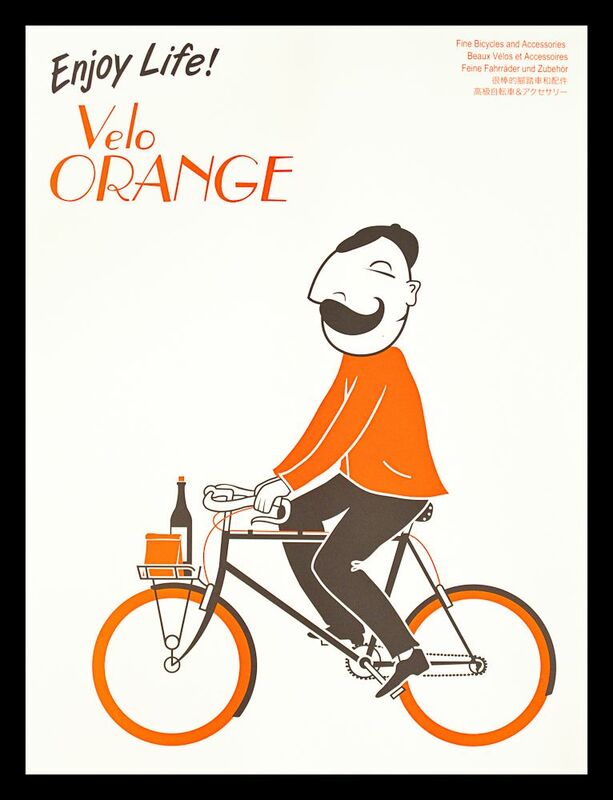 It also doesn't complain about my handlebar bag. 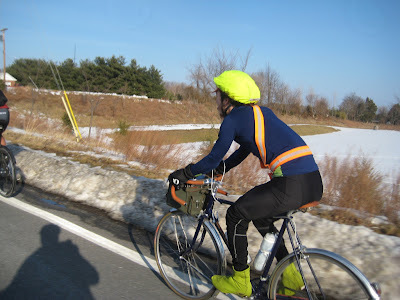 I like to carry a lot of food and clothes with me because I ride to the ride starts, so I usually have 10 or so pounds up front. 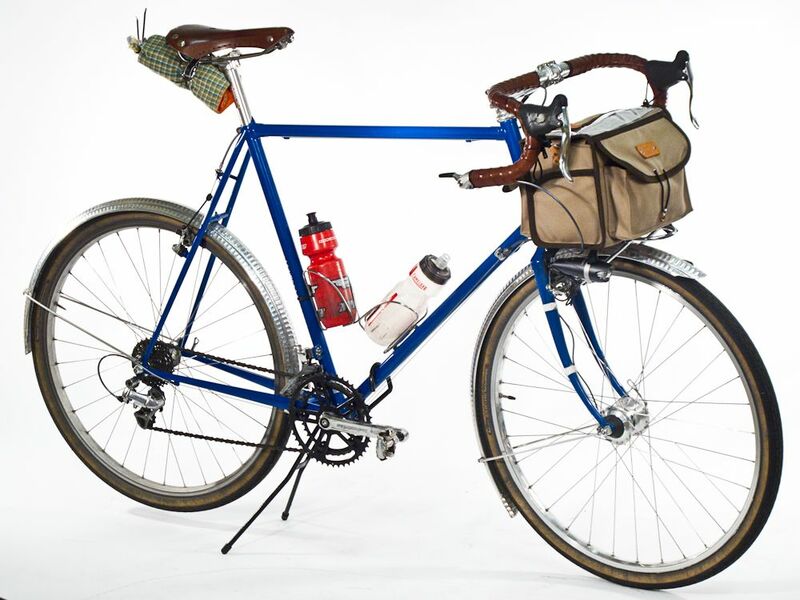 Robert's custom 650b Rando, built by Robert. 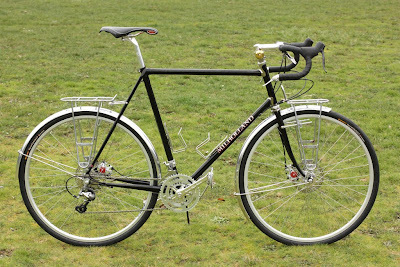 Trygve's brand new Polyvalent, just finishing up the build. 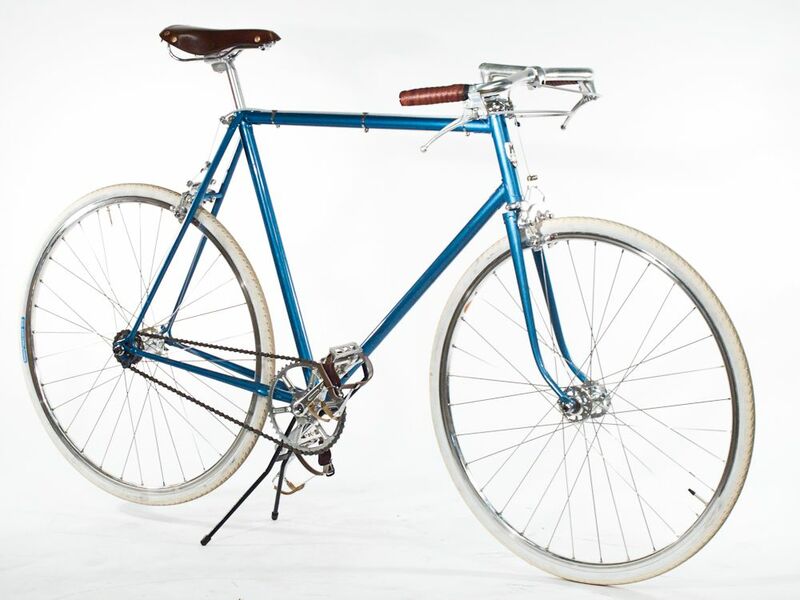 Kyle's Motobecane Le Champion fixie. 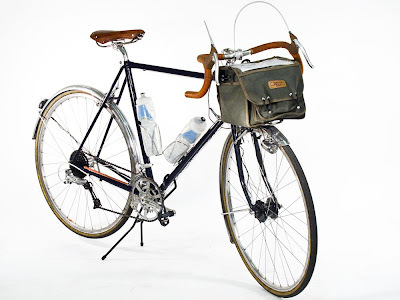 Kyle also has a Polyvalent at home. Colin's Raleigh Portage, a rare 650b production bike from an English company. 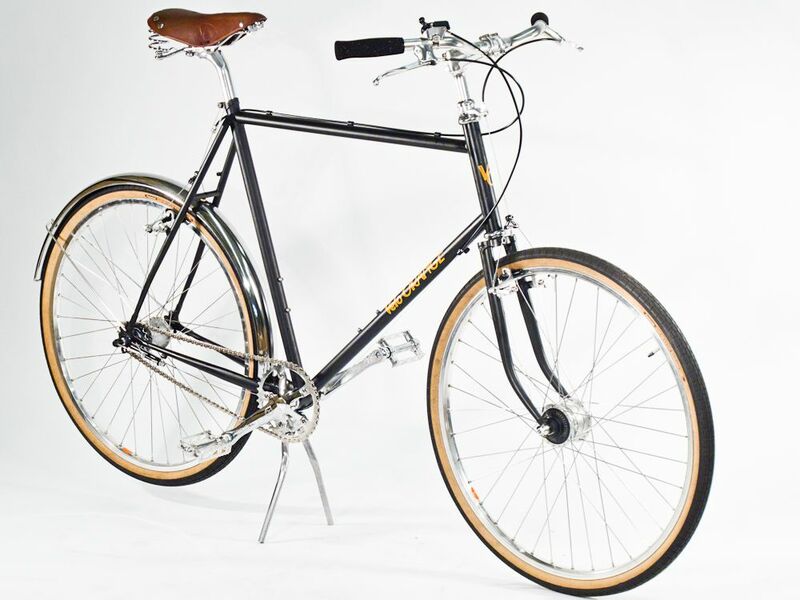 Colin's VO Mixte, a brand new project. This reminds me that VO is not a bad place to work. Staff members get parts and frames at cost, as well as lots of free prototypes and samples to test. So there are always a few cool builds in progress here. Have any new builds? Add a link in the comments. It's time for another one of our occasional flash sales. 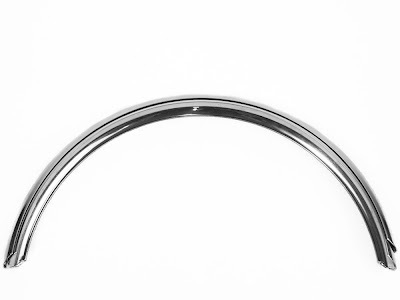 This one runs this weekend and is for 20% off on all in-stock fenders. Yes, both Honjo and VO models are included, even the ones on special. Just in time for spring showers, and mud. In case you didn't see it, the new Bicycle Times review of VO Hammered Fenders is two posts down. The coupon code is "flashyfenders". Click on "My Cart" (not "Checkout") on the top right of the screen to enter a coupon or a gift certificate. The sale runs from midnight tonight (2-4-11) to midnight Sunday (2-6-11) Eastern US time. 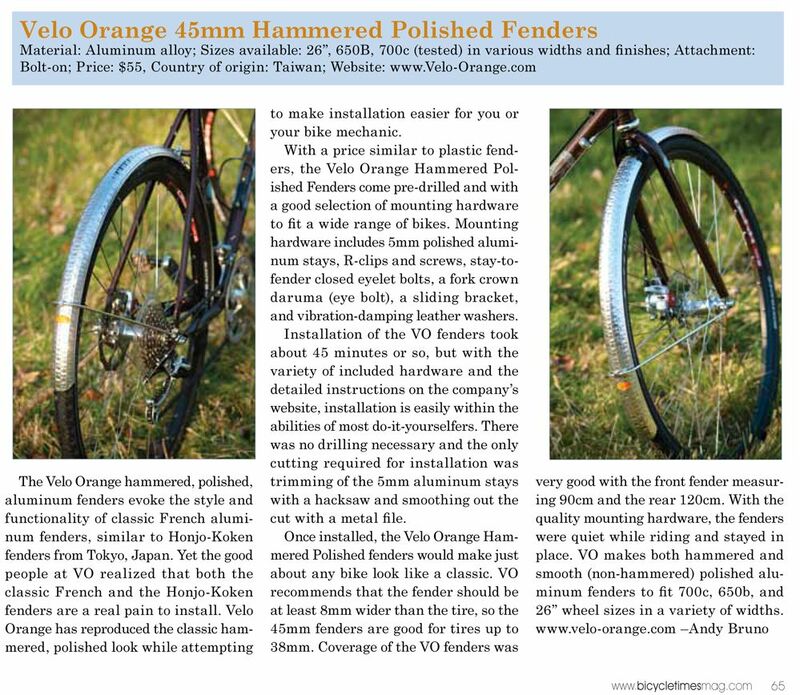 700c fenders do fit 27" wheels with no problem at all. The difference in radius between the two size wheels is only about 1/4-inch. 650b fenders fit 26" wheels and vice-versa. The fit is close enough that no one will ever notice. If you flex the fender a few mm it can be easily made perfect. 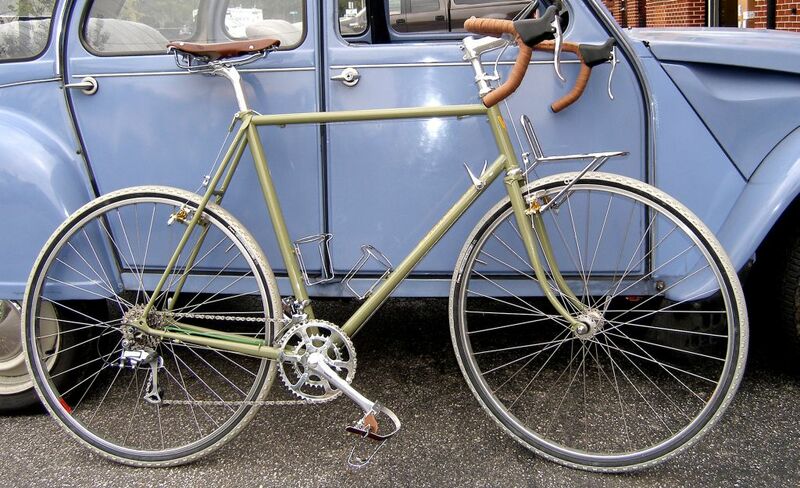 Look at the photo below of a 650b and a 26" fender. I just returned from 10 days on the left coast. I visited Vancouver BC, San Francisco, and San Luis Obispo. Also stopped for lunch in Santa Cruz. They are all great places, but San Luis Obispo, the one city I hadn't previously visited, was my favorite. This may be partially because SLO is smaller, less crowded and seems to have a slower pace. If VO opens a west coast location, a distinct possibility, SLO is at the top of my list. In addition to visiting potential distributors and being a tourist, I spent a couple of hours at Rivendell's headquarters in Walnut Creek. Grant Peterson was a great host, gave me the full tour, and showed me some beautiful frames. We even talked about a few areas where Riv and VO might cooperate. Every time Grant and I meet I'm struck by how much we have in common. One of our mutual interests is paleo diet and exercise. Paleo diet is based on the fact that paleolithic and pre-industrial peoples have incredibly low rates of most of the "diseases of civilization". These include cardiovascular disease, cancer, diabetes, Alzheimers, and many of the other maladies we consider common. Though they have a higher chance of dying at a young age, and so a lower average lifespan, once out of those dangerous years pre-industrial humans remain amazingly healthy and live almost as long as we do. Grant gave me a copy of Gary Taubes' new book, Why We Get Fat: And What to Do About It (which Riv also sell). I'd read Taubes' groundbreaking first book, Good Calories, Bad Calories, an exhaustively researched and somewhat dense review of diet and nutrition. Taubes was instrumental in showing a startling disconnect between current mainstream nutritional advice and what is actually based on science. He read hundreds of peer-reviewed studies and extensive historical data only to find that most of what mainstream doctors and the government experts tell us about nutrition is simply wrong. His findings also go a long ways toward explaining why the pre-industrial, or paleo, diet may be far healthier than what we eat today. In any case, I wasn't sure it was worth reading what's basically a simplified version of Taubes earlier book, but there was that long flight home so I did. I found the new book brilliant; thanks Grant. If you're not going to look up references in PubMed, it's a lot easier and faster read while imparting all the basics of his earlier book. Buy it (from Riv, not Amazon) and you'll learn a lot; guaranteed. Just to be clear, I don't think Taubes interpretation is 100 percent perfect, but it's darn close. I'd also recommend reading the Whole Health Source, a blog by neurobiologist Stephan Guyenet. I know I'm rambling, but if you're interested in this stuff I'll do another post with a lot of other great sources, books, and blogs about Paleo diet and exercise. An amusing aside, Grant and I are both interested in soap. Grant gave me a bar of the pine tar soap he sells. I can't say I was taken by the scent, reminiscent of a forest fire, though it's very very effective and definitely manly. I sent Grant a chunk of Savon de Marseille, an artisanal and traditional French olive oil based soap. We use it not only as soap, but also as shampoo, and shaving cream. Annette says it eliminates the need for moisturizing cream; amazing stuff. 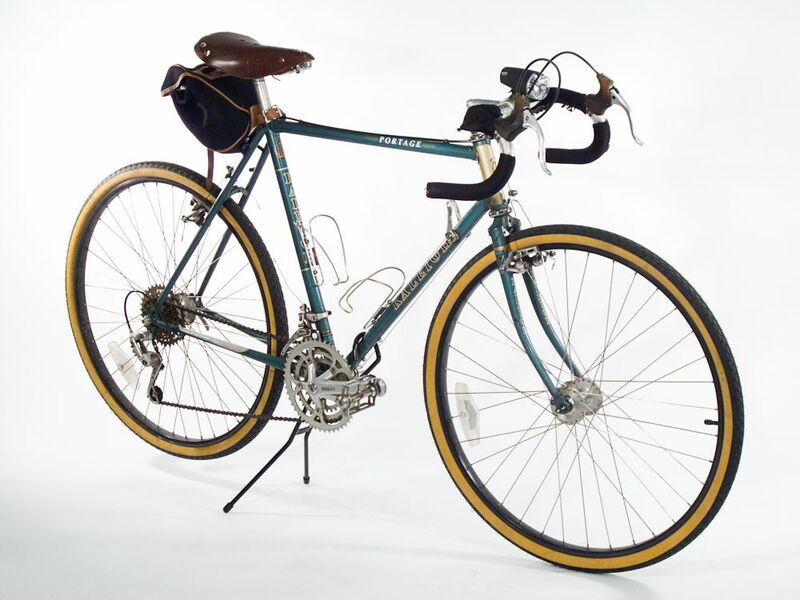 As with bicycles, most of the really good stuff was developed long ago.